Way back at the end of January, I headed back over to Atlanta to meet my concert buddy Laura once again, this time to catch alternative rockers 30 Seconds to Mars. Fronted by singer/songwriter Jared Leto on rhythym guitar, the rest of the band consists of his brother, Shannon Leto on drums/percussion, and Tomo Milicevic (lead guitar). For those who might be unfamiliar, this is a band with a very memorable sound that I find hard to describe – but I’ll give it a go anyway. Mixing surrealish, larger-than-life prog elements with an energetic rhythm, Jared Leto’s incredible voice, and lyrics which speak to the band’s fans on so many different levels, it’s somehow both aggressive and hypnotic at the same time. I find myself lost in it for hours. Like several other acts I’ve seen recently, this would be my first time to see them. But definitely not the last! I had already heard from several people how amazing their live performances are, so I couldn’t wait to experience this for myself. In fact, one friend said if she didn’t have responsibilities, she’d follow 30 Seconds to Mars around. After having seen them, I would have to agree. I totally get that now. I arrived in Atlanta pretty much on schedule that afternoon. The venue was located no more than two blocks away from our hotel diagonally, and as I was on the way to the hotel, I saw fans already lined up to the end of the block. After getting checked in and refreshing makeup & such, Laura and I headed out to secure our place in the now unbelievably long line. Despite getting in line at a time when it had now passed the end of the block and wound around, Laura and I managed to basically still walk up to the front. Actually, we were originally behind people who were at the security barricade, but they had purchased stageside seats for Mars’ performance. So we just chilled before the show, made several awesome new friends and future concert buddies – which we are both still in touch with! Guests Middle Class Rut finally took the stage. I had never heard of them before, but they sounded good and the crowd seemed to like them. In fact, I have since taken the opportunity to listen to their music in a non-live setting, and I like them a lot more than I had expected to. Their latest, No Name No Color, is on my “must buy” list. 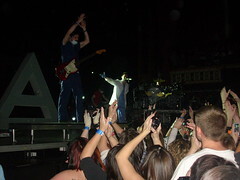 Known for their high-energy live performances, the band launched immediately into “A Beautiful Lie,” while Tomo ran from one side of the stage to the other, and Jared bounced, spun, and encouraged the crowd to jump! And Jared Leto’s got some MAJOR crowd-working skills, lemme tell ya! From the moment the band took the stage till they stepped off after the final encore, he interacted with the crowd, thanked the fans profusely and multiple times for the sold out show, and seemed to be making every effort to make sure everyone there was having a great time, and that every person in attendance felt involved as opposed to just being there watching. I left this show feeling happier than I had in months. I just loved everything about it! I loved how they engaged the crowd so much. I especially loved how crowd interaction wasn’t limited to the fans in the first few rows on the floor. I love how their fans are so amazing to one another (or at least they were at this show). 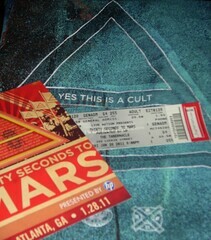 30 Seconds to Mars is BEYOND PHENOMENAL live, and I will never forget what a great concert experience this was for me. You can bet I’ll be seeing them again, whenever and wherever possible! You should definitely check them out in person. Even if you don’t like the music (but I don’t see how you couldn’t), have you SEEN how hot this band is? Thanks so much for reading and commenting; that made my day! I’ve been out of pocket and not able to promote like I usually would, and I was really worried no one would ever see it. Oh, and it’s a shame the youtube vids I included don’t show up….I found some really neat footage i wanted to share from the Atlanta show. Generally I don’t learn post on blogs, but I wish to say that this write-up very compelled me to try and do it! Your writing taste has been surprised me. Thank you, very nice post.